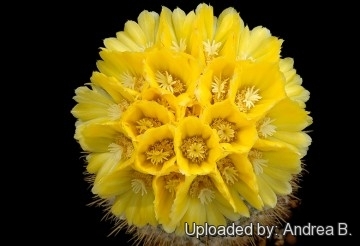 Description: Parodia aureispina is only a variant of the extremely variable Parodia microsperma. 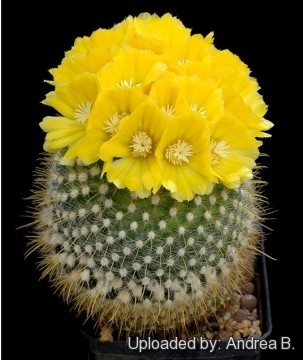 Characteristic of this frequently offered cactus are its strong, yellow spination and its yellow flowers. 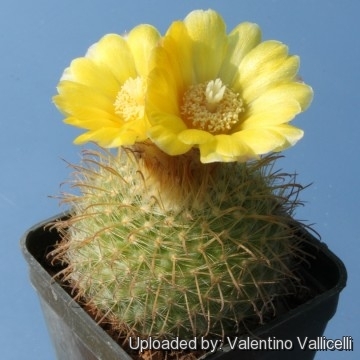 Similar varieties: It is very similar (if not the same) with Parodia mutabilis and Parodia aurihamata, and the three plants are not readily distinguishable, if not for the geographical provenance. 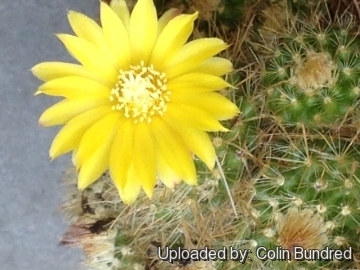 Habit: Compact small to medium-sized cacti densely covered in dense white and yellow spines. Usually solitary, but can forms small clusters. Ribs: 13-21 spiraling with conical tubercles 4-5 mm in diameter 3 mm long. 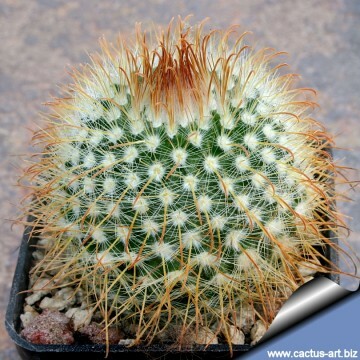 Radial spines: 11-13 thin,bristly, white, up to 7 mm long. Central spines: 4, Short, hooked of which the upper three are honey-yellow to reddish-brown with a reddish tip, while the lower one is more long and strong. Flowers: Bright yellow, infundibuliform on the plant apex 2,5 mm long, 40 mm in diameter. External tepals spatulate or lanceolate, denticulate yellowish-orange.The throat is yellow, the filaments bear cream-yellowish anthers. Stile white-yellowish bearing a 12 lobed stigma. 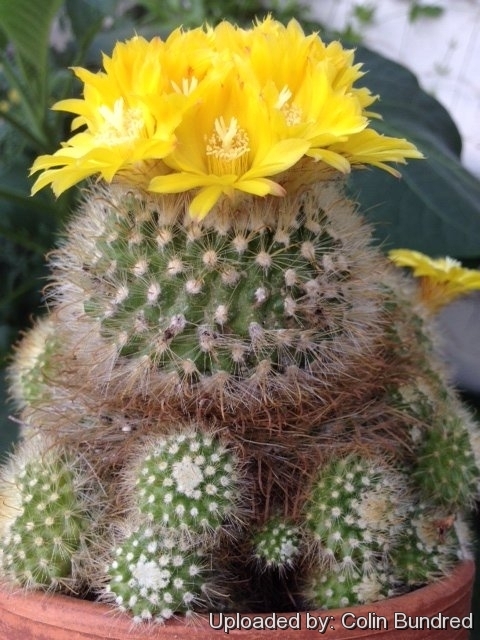 Blooming season: Produces several flowers simultaneously in early summer (while at Parodia maassii they usually appear one by one), the flowers remain open for about three days. Fruit: Ovoidal 6x5 mm, with basal dehiscence. Seeds: Very small 0,4mm long, brown smooth and shining. 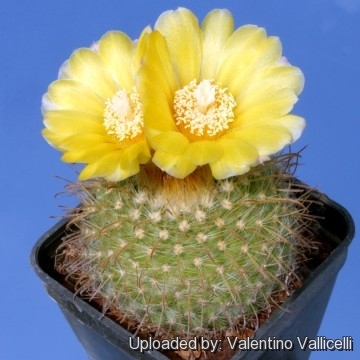 - It is a compact plant from Argentina that could develop up to 30 golden-yellow flowers simultaneously in early summer that remain open for about three days. 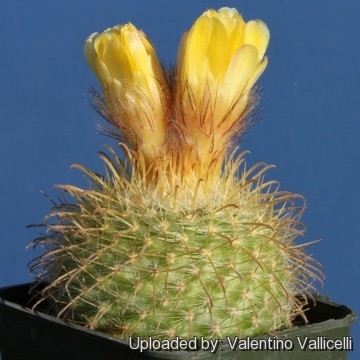 (Parodia microsperma subs. aureispina) Photo by: Andrea B.
Parodia aureispina (Parodia microsperma subs. aureispina) Photo by: Andrea B.